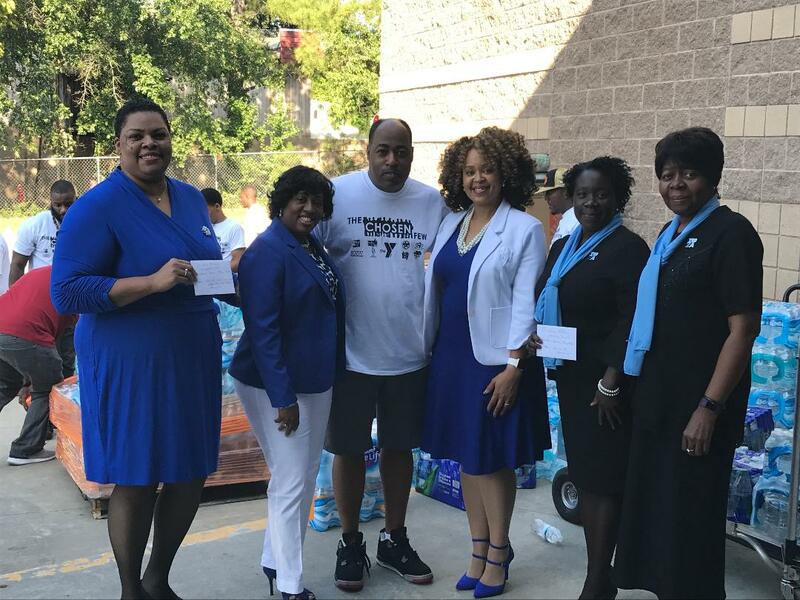 On Saturday, September 9, 2017, members of Kappa Iota Zeta and its auxiliary, the Amicae of East Point, gathered with other community volunteers at the Walter and Andrew Young Family YMCA for the YMCA’s Help Houston Project. The Amicae and members of Kappa Iota Zeta presented Mr. Gavin McGuire, YMCA Executive Director, with a check to be used to purchase water for residents of Texas displaced by Hurricane Harvey. The Zetas and Amicae also assisted with loading cases of water on a truck headed to Houston. Kappa Iota Zeta Chapter and the Amicae of East Point have enjoyed a strong relationship with the Young Family YMCA and look forward to more partnership opportunities that will benefit the city of East Point and communities beyond. Shannon McGuire-Lee, Kappa Iota Zeta President; Tara Locket, KIZ 2nd Vice President; Gavin McGuire, Young YMCA Executive Director; Michelle L. Robinson, KIZ Amicae Auxiliary Co-Chair; Connie Lincoln, Amicae of East Point – President; and Jenette Lewis, Amicae of East Point. Cheryl Johnson, KIZ Amicae Auxiliary Co-Chair; Queen Lackey, Amicae of East Point; Judy Beasley, Amicae of East Point.